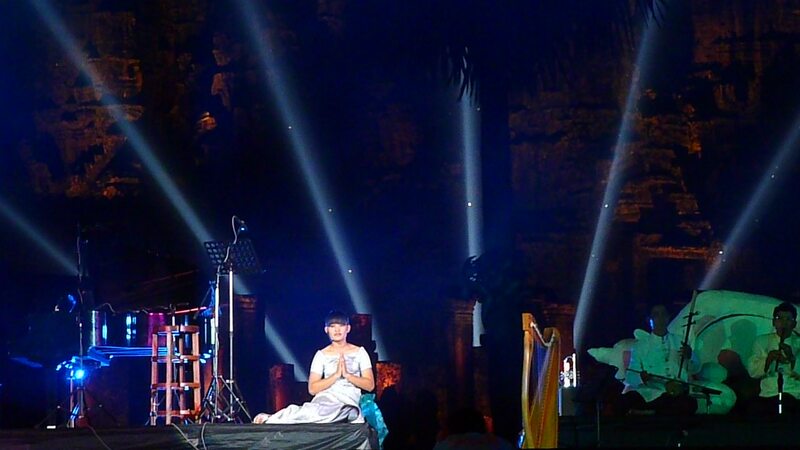 I first heard about the concert when Petra and I were wandering around the Bayon Temple and we saw them setting up the stage, lighting and sound systems. We couldn’t get much information in English, but there were posters all around with Bosba PAHN’s picture that looked enticing enough. We found out that the following evening was for ‘dignitaries’ with a price tag of $80 to $100 per ticket. But they also told us that there were tickets for $2.50. That sounded more like my speed – so I was off to figure out how to get a ticket. Unfortunately, Petra wasn’t going to be able to attend as she was leaving the next day and the less expensive show was the following evening. Dohn, our tuk-tuk driver, took me to the mall (yes, the mall!) where they were selling tickets and I easily procured my $2.50 ticket. Just to be at the temples in the evening was a treat since they are normally closed at 5:30 pm. 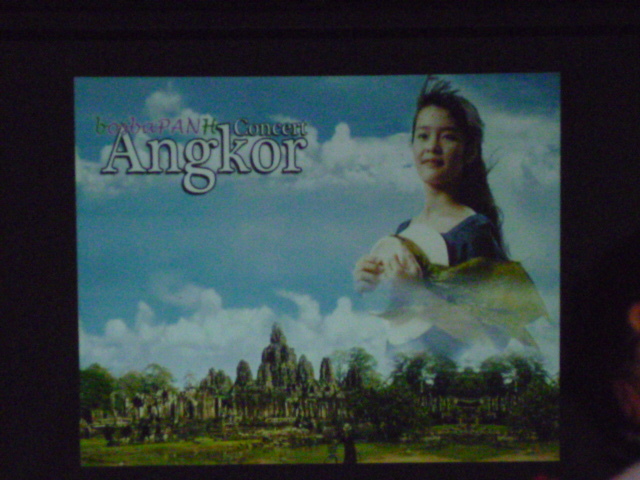 I decided to head to the Bayon a few hours before the concert – Dohn drove me there, but once we were inside, he found out that he wouldn’t be able to get back in to pick me up – which meant that he had to hang out in his tuk-tuk waiting for me from 4 pm until close to 10 pm – he offered to do so, said he didn’t want me to get stuck there – such is the life of a tuk-tuk driver! The Bayon Temple, like all of them, is extraordinary. While Petra and I had already spent some hours there, it was when hordes of people were there. 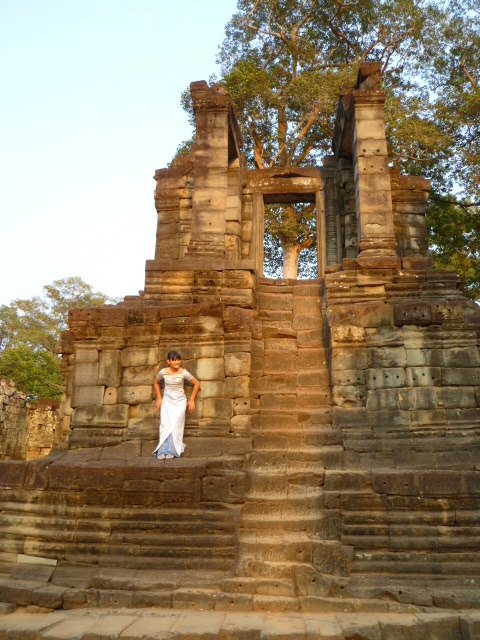 I had learned that late afternoon is often a good time to find the temples not so over-run with people. And since Petra and I had spent some time at temples with no one around, I knew what the difference in ambience and energy was like. 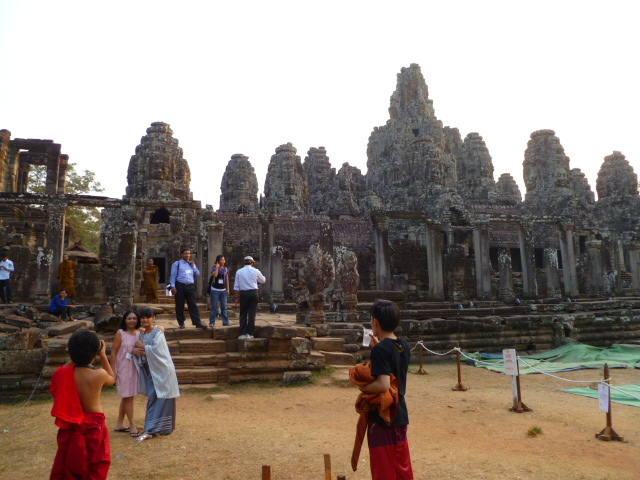 The Bayon was definitely worth another visit. 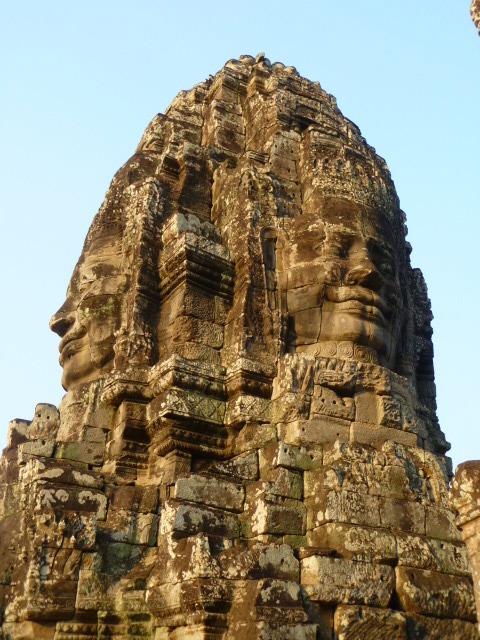 The Bayon was built in the 9th century and is home to 54 towers which have more than 200 faces larger than life carved into them. It’s dramatic and startling to see them from a distance, but it’s also amazing to climb into the temple and glimpse them up close. That’s where they seem to come alive. 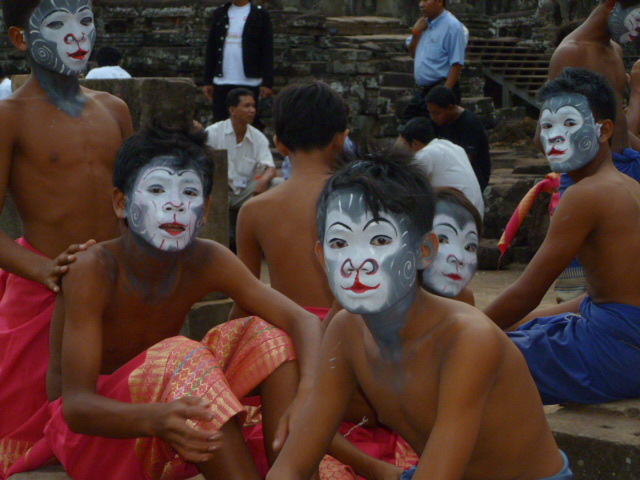 The Khmer smile grins enigmatically from every one of these faces. And their eyes, as it’s said, seemed to follow me wherever I walked. I enjoyed finding a quiet spot and sat, looking out at the towers and taking in the mysterious energy. I was thrilled to find some quiet places out of sight and earshot of tourists – it was just me and the temple and I sat in quiet and content contemplation. 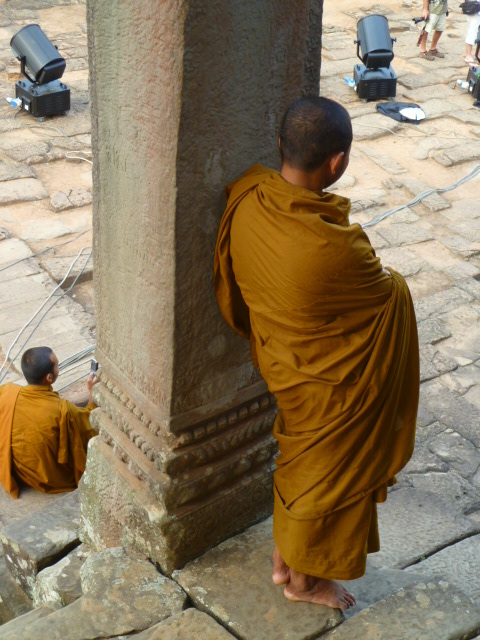 Out of the corner of my eye, I saw a few monks standing nearby – something seemed to have their attention, so I walked in their direction. Boldly, I sat down next to one of them, curious to see if he would talk to me. He did. He directed my attention to some people in the distance, also on the temple grounds, and said, “Bosba PANH,” and sure enough, there she was in the midst of a photo shoot and rehearsal before the show. I noticed a few tourists in the mix and ambled over to get a closer look. No one stopped me, no one even noticed me. All attention was on Bosba. She was relaxed, singing some songs and playing around with her friends. The casual, easy energy was a delight. As I looked around, I realized we were actually backstage – there was no fanfare, though, no security of any kind whatsoever. Plenty of people were milling around, lots of performers were getting dressed and putting on make-up. Taking pictures didn’t seem to be a bother to anyone, so I hung out there completely undisturbed and eagerly snapped away. As time got closer to the show, I headed out to find my seat – since it was a general admission show, I wanted to get the best seat I could in the cheapie section – of course I got the first row in that section and was still only several rows back from the front. There were plenty of tourists, but I was mostly surrounded with local people. The sun began to set and as dusk descended, the lights over the temple came on. The sight was phenomenal and only got more and more spectacular as the darkness deepened and the temples were lit up with strobes and different-colored lights. And sure, the setting of the temples was stunning. And yes, the lights were fantastic. But this young woman, this girl at only 13 years old, was really the most incredible of all. Her grace and poise were palpable and seemingly effortless. 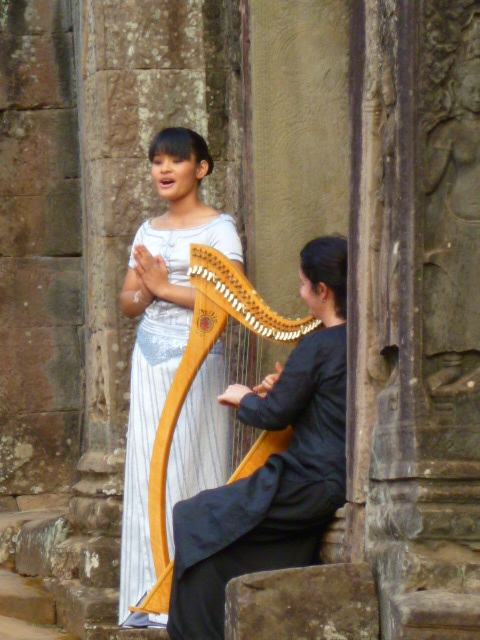 She began and ended every song with her hands in prayer, a very common Khmer greeting of respect and honor – and she did so with a natural sense of humility and tenderness. Ohyes, and her voice! If silk had a sound, this would be it – soft, natural, powerful, sensual – such presence and talent! After just a few songs, I moved to the front row and sat on the ground for the duration of the show. Again, no security, no fuss, no one paying any regard to me. All eyes and eyes were on Bosba – we were all entranced with her talent and beauty – she sang all the songs in Khmer and that I didn’t understand the words mattered not one bit – words simply melted in the background and the sound of her voice with musical accompaniment was the language that we all understand. I was so taken with her – I’m still so taken with her. Partly I think this is because as I spend more and more time here in these impoverished countries, I look at the children and I wonder what will become of them – what chances they have to discover their innate talents, to give their unique gifts to the world – and I’m saddened by thinking about how limited their chances are. And then there’s Bosba – who clearly has a family of extraordinary musical talent from whom she’s been able to emerge and find her voice and share it with the world! They say timing is everything. And my timing to be in town that evening was superb! Bosba PANH – oh what a night!